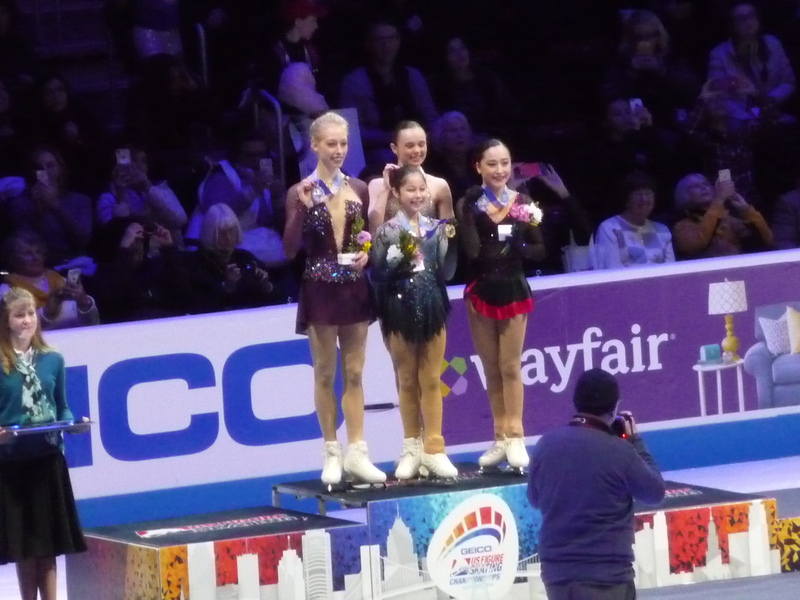 Editor’s Note: Heather Carrelli, website manager for Tarah Kayne and Danny O’Shea, is writing a blog, on her experiences as a fan at the 2019 U.S. Championships. This is blog number 4. 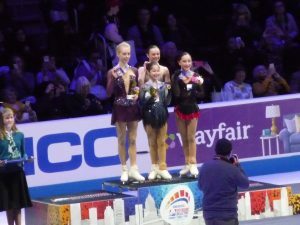 Here are links to read her previous blogs: #1 (Arriving at U.S. Championships), #2 (The Detroit Adventures), #3 (Let the Senior Begins). The first competition of the day was the junior dance final and it turned out to be a wonderful competition. I don’t know ice dancing technical info as well as I know the other disciplines, but I really enjoyed quite a few of the teams. The gold medalists, Caroline Green and Gordon Green skated a wonderfully smooth and intricate program that I really enjoyed. 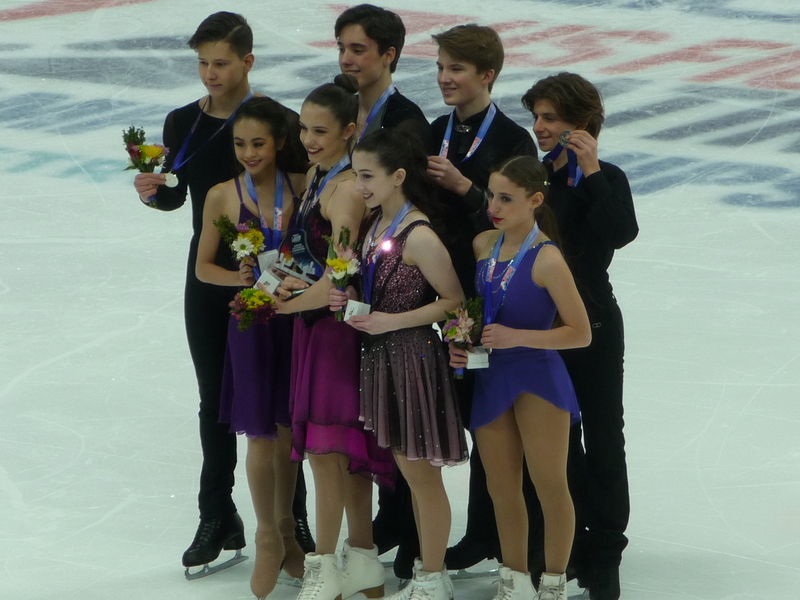 I also really liked the silver medalists Avonley Nguyen and Vadym Kolesnik. These two teams are definitely primed to make a mark on the senior ranks when they’re ready to move up a level. Some other teams that I enjoyed in this competition are Oona Brown & Gage Brown, Jocelyn Haines & James Koszuta, and Eliana Gropman & Ian Somerville. I think our U.S. ice dancing program is in very good hands if all of these teams can keep improving and stay together! The next competition was the senior dancers who would be skating their rhythm Dance programs. After watching practices earlier in the week, I was very curious which teams would step up and skate it out of the park here. I was very impressed with how smooth and polished Madison Chock & Evan Bates looked after being off the ice for so long with Madison’s injury. They skated a wonderful rhythm dance and set a very high standard for the other teams (they were the first of the contenders to skate in this competition). I was also impressed with Rachel Parsons and Michael Parsons, who also performed a fabulous rhythm dance and put themselves right in the medal mix. The reigning U.S. Champions, Madison Hubbell & Zachary Donohue didn’t disappoint the crowd and skated an incredible rhythm dance to take over the lead from Chock & Bates. The last three teams to skate also brought out spectacular programs and were bunched up very close together at the end of the competition. Kaitlin Hawayek & Jean-Luc Baker were in third place, but Christina Carreira & Anthony Ponomarenko and Lorraine McNamara & Quinn Carpenter were right on their heels. Third, fourth, and fifth place were definitely going to be decided by whoever skated the cleanest and got their levels on the elements. I knew it was going to be a tight battle but those three teams were only separated by about 2 points at the end of the rhythm dance competition! Yes, ice dancing in the United States is quite healthy and probably the toughest competition for all of them! In between competitions, we had the opening ceremony, which was a big production full of area skaters celebrating the various Detroit sports teams. U.S. Champions Jeremy Abbott and Alissa Czisny were part of this celebration and it was so great seeing them on the ice again. We actually ran into Jeremy after the day’s events were over when we were in the arena concourse and it was great to tell him how much I enjoyed seeing him back on the ice again. He was appreciative of the compliments and couldn’t have been nicer to us. Our young skater/seatmate was able to get her picture with Jeremy too which was really cute. The ladies final was the last competition of the day and we all kept talking about how weird it was that we were having the ladies final prior to seeing any of the men’s competition! It was a rather weird quirk of the schedule and all we could do was shake our heads over it. The competitions started off rather slow but then, rising star Ting Cui just blew it out of the arena with an incredible long program filled with personality, great jumps, and awesome spins. She was spectacular and put up a score that we knew would hold for a while. Megan Wessenberg also skated a fabulous program with some beautiful musicality. The last group of ladies was where the big guns were skating and honestly, it wasn’t the greatest night of skating overall. I was disappointed that Emmy Ma couldn’t repeat her wonderful jumps in her long program, although I still believe she has a bright future. Amber Glenn was another one who didn’t have the long program she was looking for in the final. Hanna Harrell, on the other hand, continued to be a revelation for me. She skated a beautiful long jump with amazing jumps (she does the hands over your head thing in her jumps, but she does it very nicely) and proved that her great short program score was no fluke. I am very excited to see how she progresses in the next few years! Bradie Tennell had what I would call an up and down long program. She had some wonderful moments (her artistry and presentation have definitely improved) but some of the technical content wasn’t quite there today. It was SO odd to see her fall! She’s still amazing though and I really enjoyed her program overall. Mariah Bell also skated a wonderful long program, but had a few hiccups of her own on the jumps. I was very happy that she ended up on the podium though. OK, I saved the best for last. 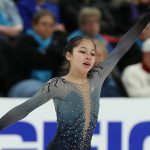 Alysa Liu absolutely shined in her long program. She did two triple axels like they were just nothing and then skated an incredible long program filled with amazing triples, nice spins, and her sparkling personality. She absolutely lit up the arena and deserved to win overall, in my opinion. She didn’t make any mistakes in either program and her charming personality completely won over the entire crowd. She definitely won the night for me and her interview afterwards was adorable. I’m excited to see what the future holds for her and in my opinion, the future is awfully bright for this young lady! I think my favorite moment of the night was when Alysa couldn’t get up to the top step of the podium during the medal ceremony and Bradie and Mariah helped her get up the step. That was so cute! You would think after almost a full week of random issues that maybe some of them would let up but nope, we still ran into some on our way back to our hotel. After we got to our hotel, we went up to our rooms hoping to crash for the night and once again, for the third night in a row, our keys didn’t work! Mom went downstairs to the front desk and complained again about the keys and we did finally find out that apparently the Cobo Center(which had the Auto Show going on the same weekend as Nationals) uses some sort of security device that deactivates their hotel keys. The only problem is that we were at Little Caesar’s Arena, which wasn’t mentioned to her at the time. We did find out the next night that the Little Caesar’s Arena also uses the same security feature though, so we finally started going to the front desk to reactivate our keys before we even went upstairs to our room. I wish someone had told us that a lot sooner so we could have saved us some stress and a lot of extra trips back and forth in the hotel! Day six of my week in Detroit is coming up tomorrow with the first two groups of the senior pairs final and the men finally take the ice for their short program competition. Then we have the top two groups of senior pairs in their final. Then, we end the night with the senior dance final. Thanks once again for reading and I hope you’re enjoying my take on the U.S. Championships this year! PREVIOUS Previous post: From the Stands: Let the seniors begin!